I don’t typically use many apps on my phone – email, camera, phone, and text/chat are about the only things I ever open. 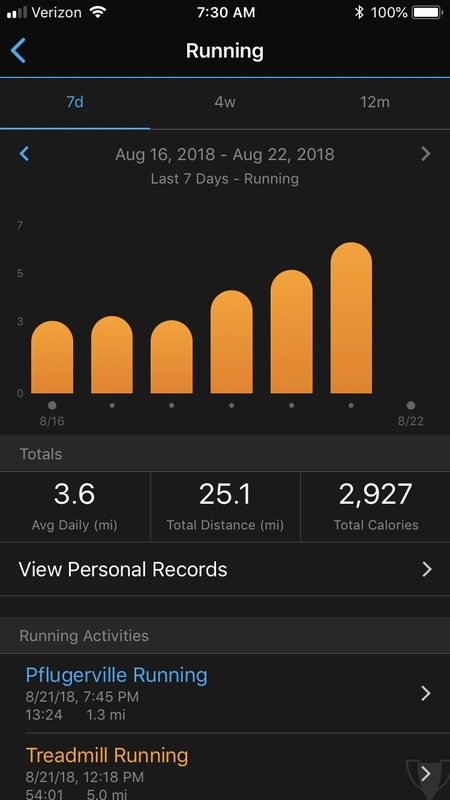 Recently, though, I’ve been using MyFitnessPal, Garmin Connect, and Strava. 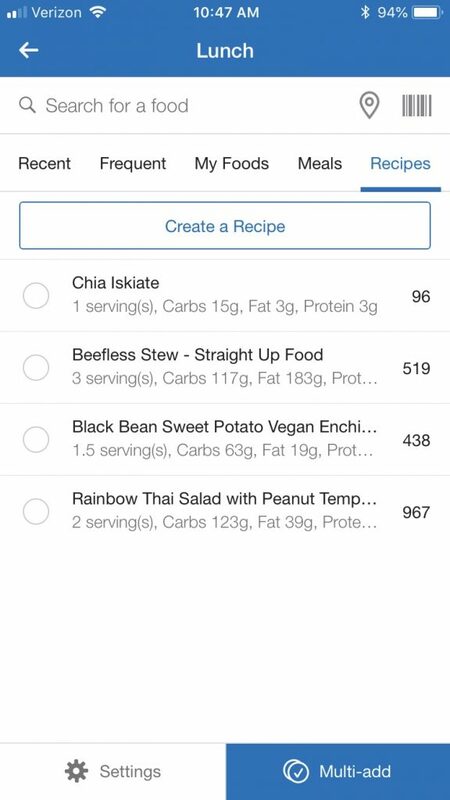 MyFitnessPal is free (ad supported) or paid. If you pay for it, you don’t have ads and you gain a few features. I have Premium, mostly to get rid of the ads, but Kelly opted to keep the free version as they don’t bother her. The paid version costs $49.99 per year. 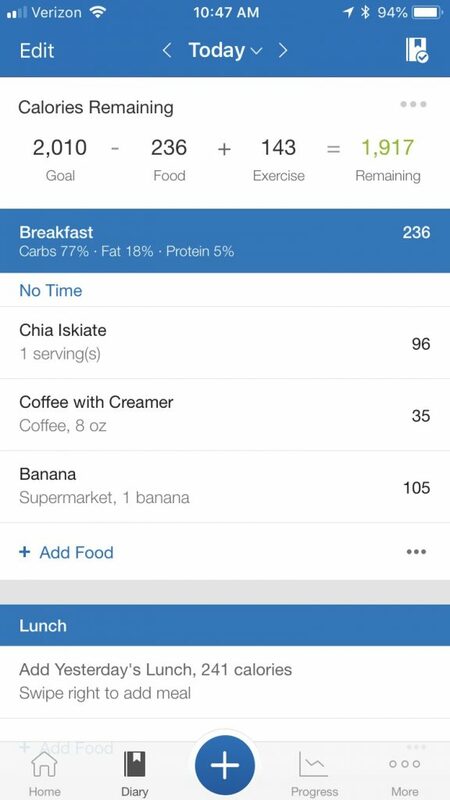 MyFitnessPal is able to track both food and exercise, but really lacks compared to the other two when it comes to exercises. However, both rely on MyFitnessPal for calorie tracking, and MFP does that really, really well. It has a gigantic crowd sourced database of foods, containing almost everything you might want to add. It syncs with other apps (like Garmin) so you aren’t stuck adding any info in manually. 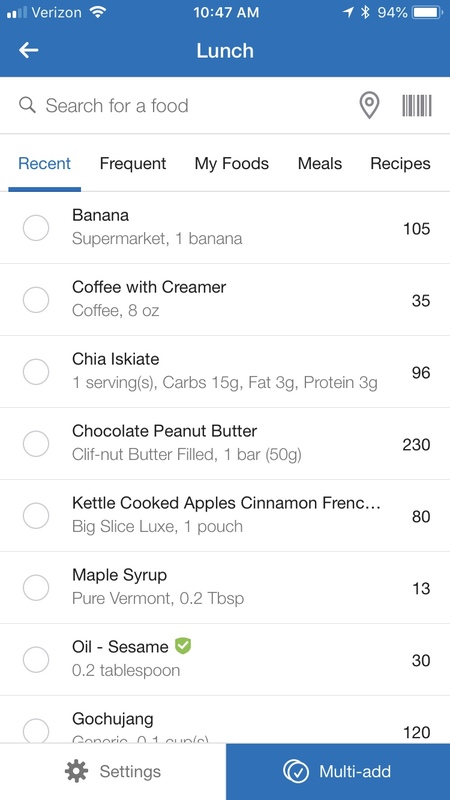 The “food diary” is biggest reason to use the app. You provide your age, gender, height, weight, fitness level, and goals, and it will provide you with guidelines for both calorie intake and macro-nutrients. The diary tracks intake and progress. You add items you consume here. It has a “Recent” tab as well as a “Frequent” tab, that will hold things you reach for quite often, so you don’t have to go searching. 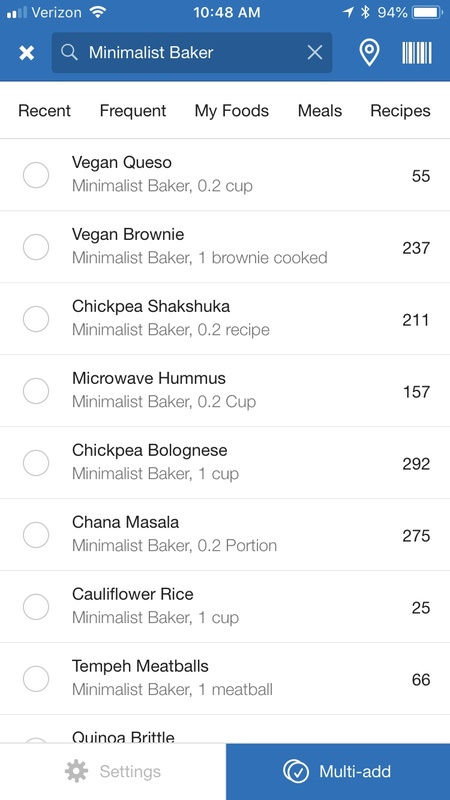 You can add your own “saved meals” for quick access, or recipes. Or you can search their gigantic database for items other people have added. 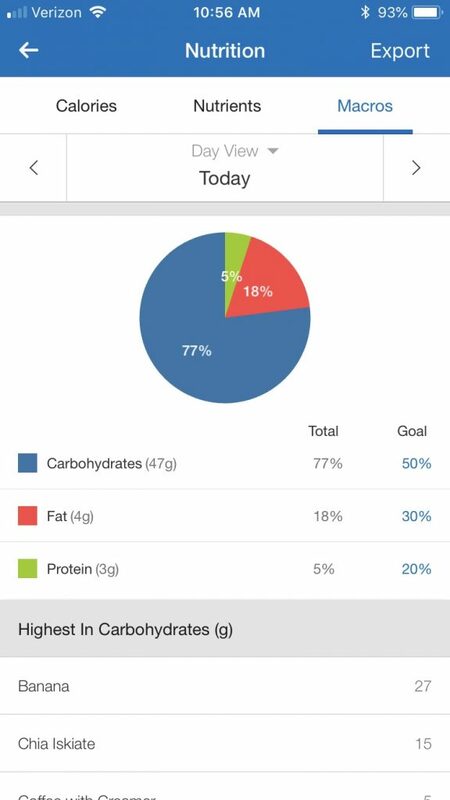 If you want to track macro-nutrients, it will break down everything for you. This is where the paid option excels, though I don’t use it that often. 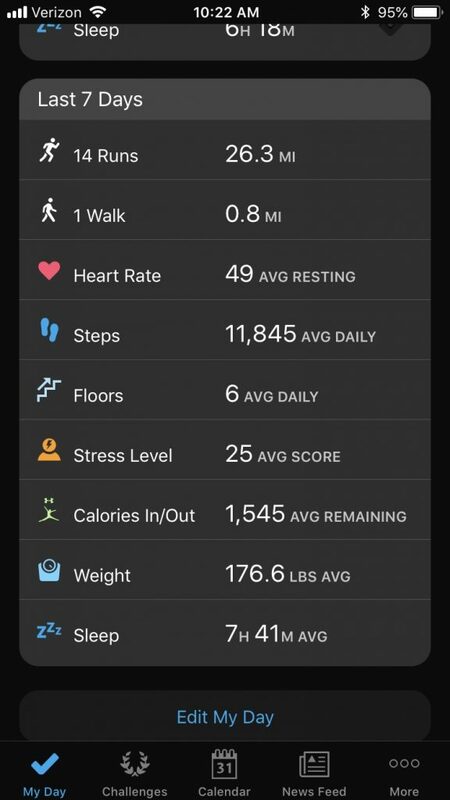 Garmin Connect is “free”, but the cost is really embedded in the costs of the devices you purchase to use with it. 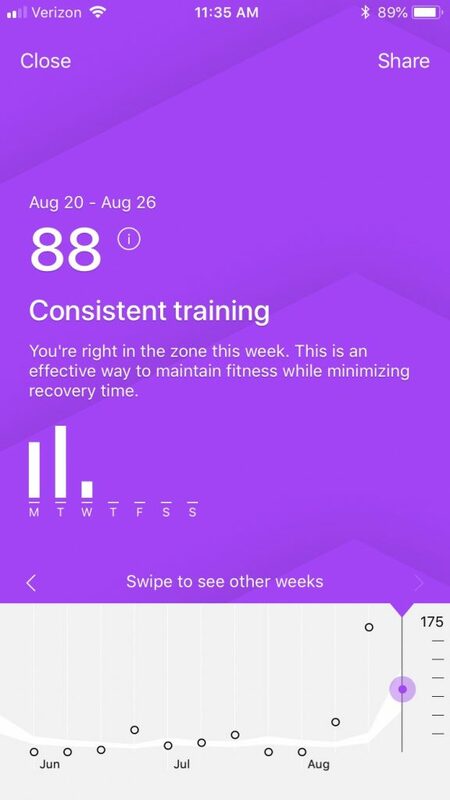 Most Garmin fitness trackers work with it, but the higher end devices, like the Fenix and Quatix line, are several hundred dollars. The luxury Chronos line can run well over a thousand. I have a Quatix 5 Sapphire, which I upgraded to from a Fenix 3 Sapphire. I gave my dad my Fenix 3 when I upgraded, and he seems to really like it. I chose the Quatix over the Fenix for the stainless bezel, and chose the Sapphire model for the stainless band (quick change bands, I also have straps), WiFi and scratch resistance. With WiFi, you do not need to sync to your phone to upload workouts. Kelly moved from a Fitbit Blaze to a Garmin Fenix 5S Sapphire, after seeing how much more powerful the software is than what Fitbit provides. The Garmin watches have battery life that can be measured in weeks, are water resistant to 100M, and are built to handle quite a bit of abuse. Unfortunately with fitness trackers, the “you get what you pay for” mantra fully applies. Connect presents you with a dashboard for your day, by default. I went for a short run this morning before work, which is shown. It also provides an overview for the last week, and other durations you can choose. Within the app itself, you can really drill into the data and get lots of useful insight. For each activity, it will track metrics based on the capabilities of the equipment you are using. 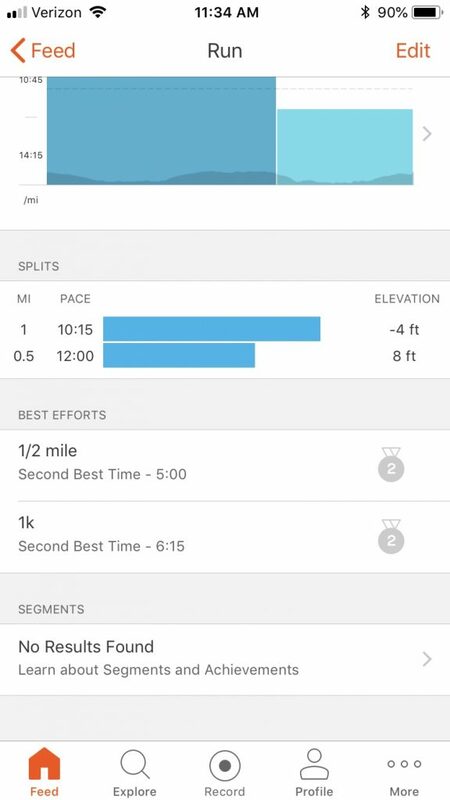 This morning I ran with my watch, and a pair of shoes that had a foot pod attached to collect more accurate stride information. This doesn’t show the entire breakdown — but only a small portion of it. 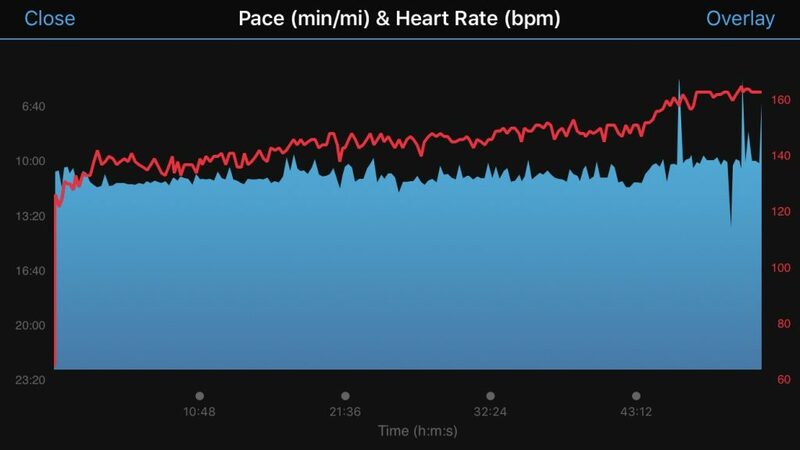 I can see the pace for each mile, graphs for heart rate, elevation, pace, and others – that I can overlay on each other – GPS mapping of the run, and more. 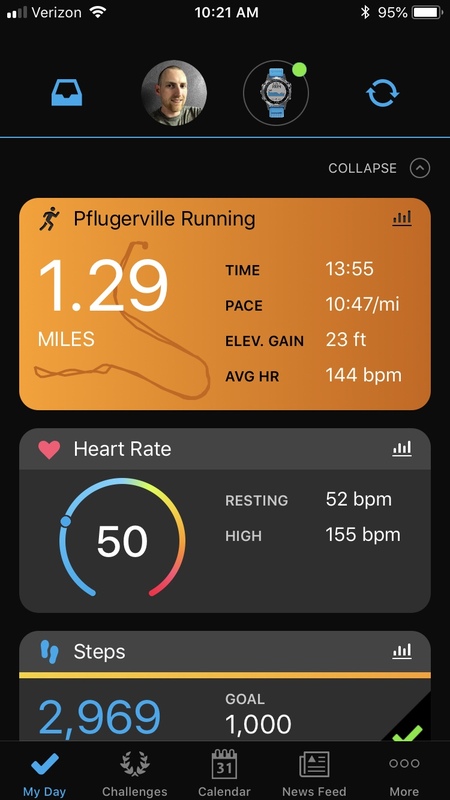 Based on your activity (it tracks all sorts of things, but I happen to be working on running at the moment) you can view history, personal records, and more. They have a web-based application, which I probably use more than the mobile app. It provides the same information and maybe a few more features. Strava grabs its data from any number of Fitness trackers, including Garmin. It processes that data and presents you different information than Garmin does. 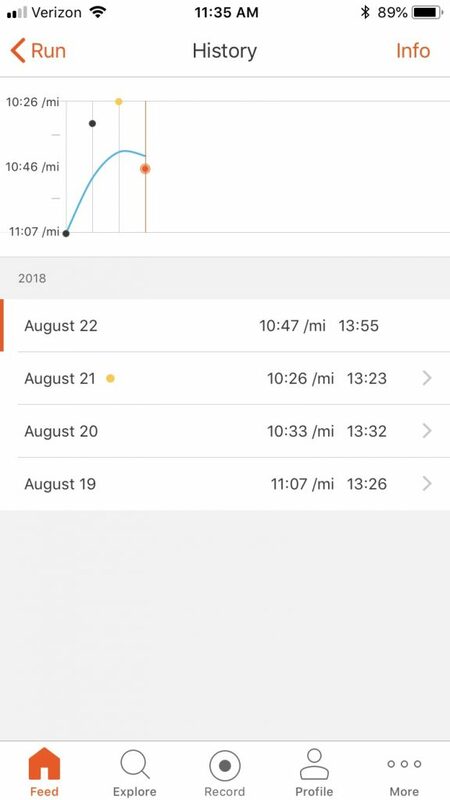 While Garmin Connect has some social media aspects, it seems that Strava is trying to emphasize that on their app. 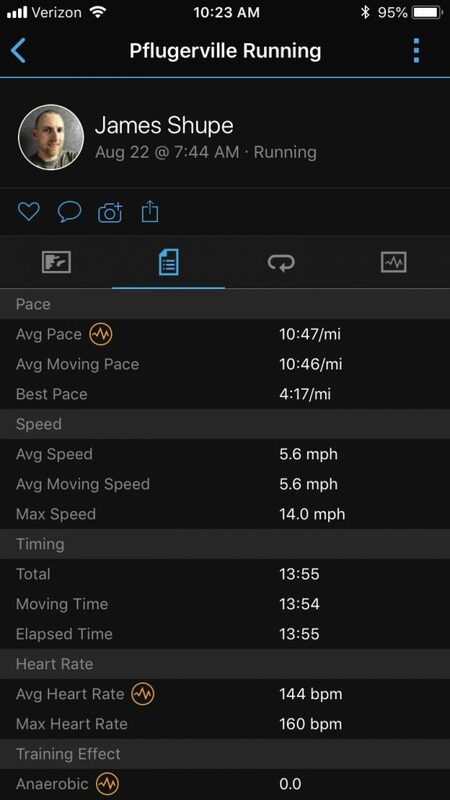 In free form, it doesn’t seem to provide any data that Garmin does not. However, the paid form, which costs $59 a year (I’m using a one month free trial, currently… to see if it is worth paying for) provides a few things that might justify its cost. I’m not convinced it is worth paying for yet — the jury is still out. With the free version, it felt that the focus of the app was following other people, liking and commenting on exercises, and sharing them. You need the paid version to access the deeper metrics, which they call “Summit”. As for the social aspect, I found three people I know on there. Of those three, only one of them has posted anything this year. The other person, who posts regularly, is a friend of a friend. And even if I did have lots of friends on Strava (especially at my current fitness level) I’m not interested in sharing all my workouts with other people. 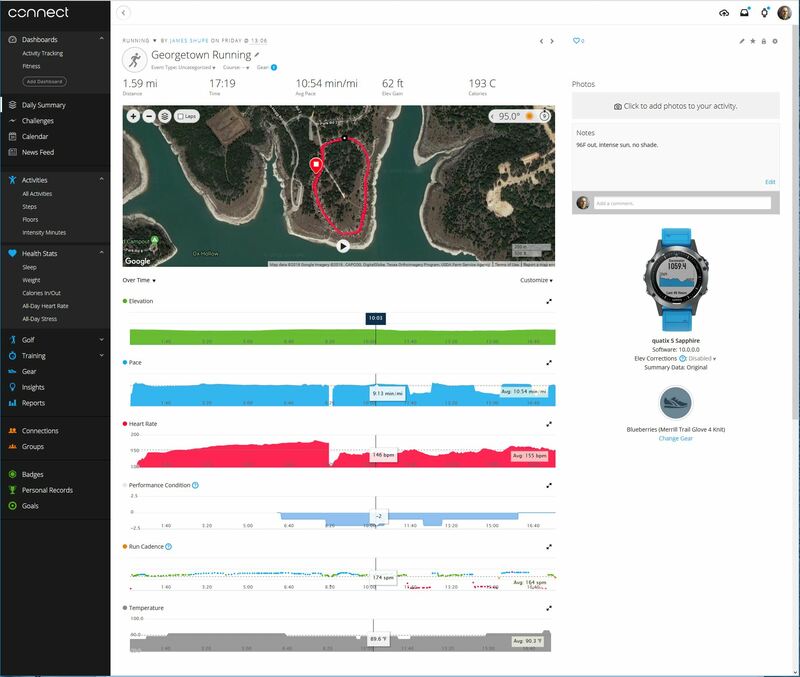 Much like Garmin, it presents you with an overview of your workout. 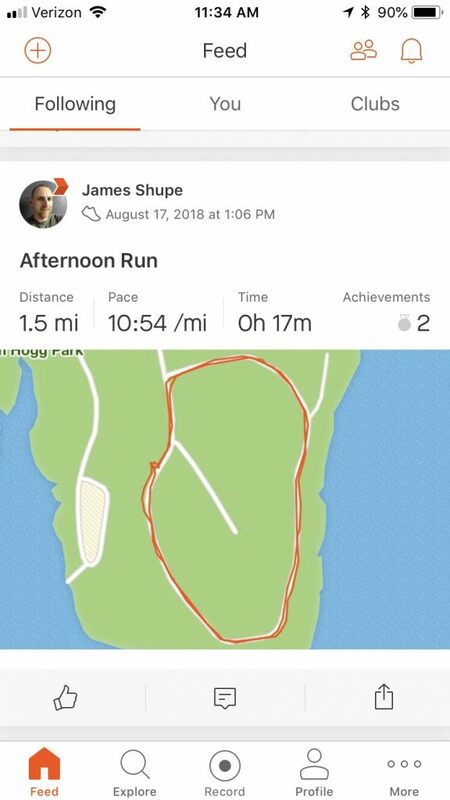 One of the features I like about Strava is that it presents you with a “Best Efforts” section for each exercise, to let you see how your session compares to previous ones. The other big feature I love is that if you run the same course multiple times, it presents trends in an easy to access, easy to interpret fashion. Garmin has the same ability, but it is not as straight forward and the Strava solution is much cleaner. Again, Garmin has something similar to this, but I think Strava does it better. It provides you with a quick overview of how you are doing and if you are doing too little, just enough, or too much. 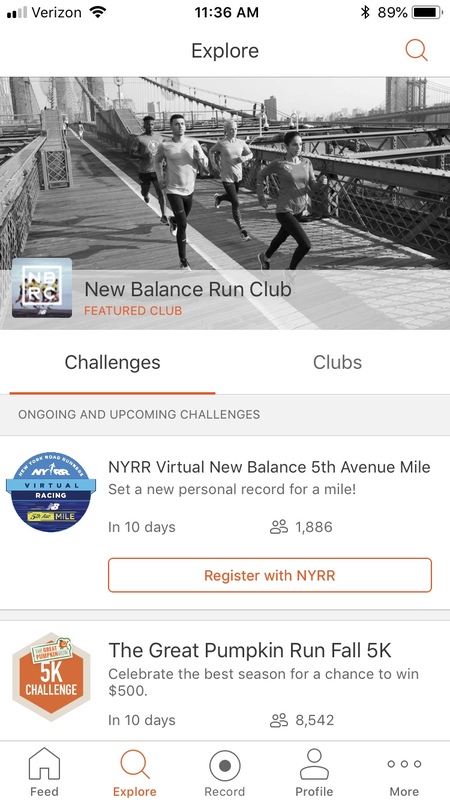 It has better challenge support than Garmin, with the ability to enroll in virtual races through the app. I can see myself doing these more than I see myself lining up on a starting line with dozens of strangers. Garmin may have something similar to be honest, but if so I haven’t found it. I haven’t really gone looking, either. Now this is a feature that makes a ton of sense and I think would be really useful, especially to runners or cyclists like Kelly, who don’t feel comfortable going on a exercises alone, especially after dark when it has finally cooled off here. I have not used it, but assume it works well as the technology is pretty straightforward. I can see myself using it on solo trail runs in the middle of nowhere, but APRS (ham radio) might be a better option if cell signal is unreliable. Over all, I like some of the things that Strava offers but am not sure I’m willing to pay for it right now. 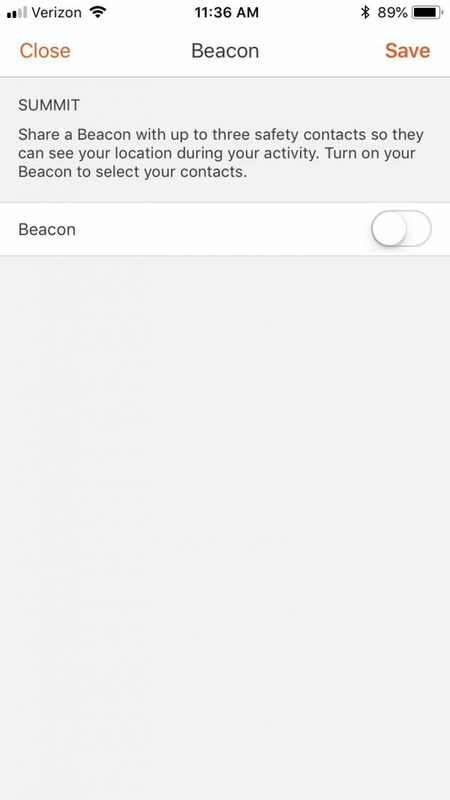 If I had more friends using it, or I was looking for something like their Beacon feature, I’d definitely spend the money. For now it’s another way to look at the same data (afterall, it gets the data from Garmin) that is free of charge for another three weeks.